I can't imagine being a parent and thinking "yes, please - I'd like to wear a uniform and get my picture taken too." I guess I just miss the good ol' days when schools gave parents jobs, cash, and cars out the back door of a smoke filled room. The parents' social media-induced vanity is making them poorer negotiators. If you're dumb enough to visit PSU, then I won't put anything past you. I promised him, only in the PL. Only if the pants to said unis are cargo shorts inspired in design. Which Ohio State 2020 kid is the first one with dad in pose? I wish football and basketball coaches had to wear uniforms like baseball managers! I'm pretty sure that Harbaugh would support this idea. Hell he'd have eyeblack on with a mouthpiece. Makes sense. You recruit the mom: the most basic rule of recruiting. Dad was an after-thought. Now dad is recruited too. Dad, the man that's already lived vicariously through his son for 12 years. I can’t tell if I ironically find humor from this or am just thoroughly disgusted. This is actually hilarious. It makes fun of those endless social media shots of kids wearing uniforms for team's they'll never play for. If the whole family is there, why not let them join in thw fun too? John Simon and James Laurenitus should've had their dad's do it way back. Hell, the Animal still dresses up in pads and face paint on occasion! I agree. I think its quite funny - cheers to those dads having a little fun with it. So they got those Dads drunk on their campus visit? Robert Landers is transferring to Florida? The guy in the Florida uniform looks like 250lbs of mashed potatoes stuffed in a hundred pound sack. Talk about living vicariously through your kid. How embarrassing. He’s like a foot shorter than his boy. How tall is the milkman? Now if they’d just start adding the full-side-of-face eye black look we’d have something even more amazing. I would want to Hague to prosecute them even though I don't recognize their court. I’d love to see those guys in a different fan base. The form fitting uniforms of today's game are not kind to middle aged physiques. This is pretty hilarious. Hat's off to these Dads for having fun with it. 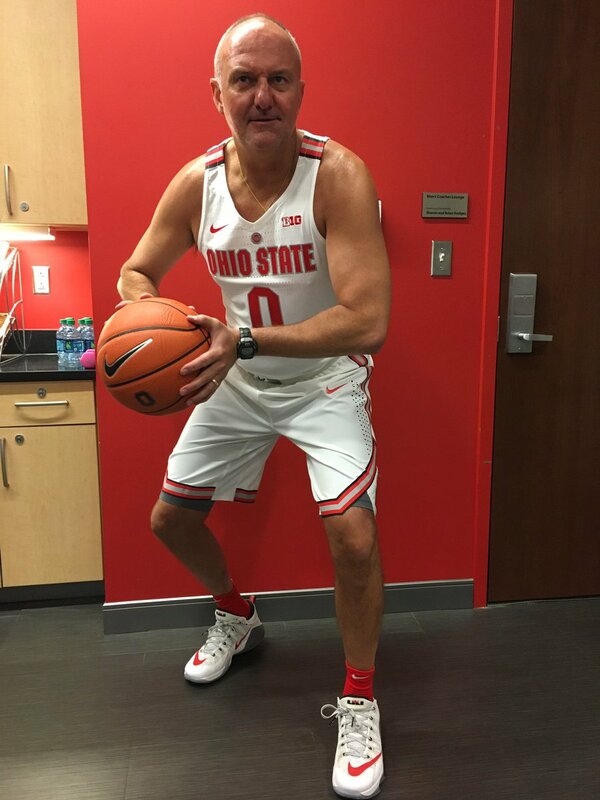 Next step is a recruit's dad dressing as an alternate for a home game and making the 85 man roster. Dads watch might get a flag thrown. So youre saying there's still a chance I get to wear a college football uniform?!?!? Getting my 6 year old on the bench when I get home. Yeah, 42 year old me would love to squeeze into a uniform and get my picture taken with my gut and manparts sticking out. If they put me in one of those photos I think I may get a scholarship offer to kick for Wisconsin. I'd better get a girdle-pad. Or perhaps they could just use photoshop to reverse my chest and my gut. Full kit wankers make it Stateside. Pass. Unless they wear it in the stands. I can see the fun of it. If one of my nephews wanted me to pose with them in scarlet in gray I'd be more than game. Bad. When I was in school, the girlfriends of the players wore the jerseys. So it seems a little fruity any other way really. At 11W, we can do better. Hey man, at some point it's not the troll's fault the troll is still trolling.